In 2006-07, the number of granted patents in India increased by 8X (15,262, while only 1,911 in 2006). While most of the patent surge is driven by MNCs, Indian companies too have increased their R&D budget. A quick glimpse at the data (below) clearly shows that few smart companies are creating IP and at the same time are able to control their R&D budget. the Department of Scientific and Industrial Research, Ministry of Science and Technology, on R&D expenditure of companies and online records of patents granted to them from 2005 onwards. 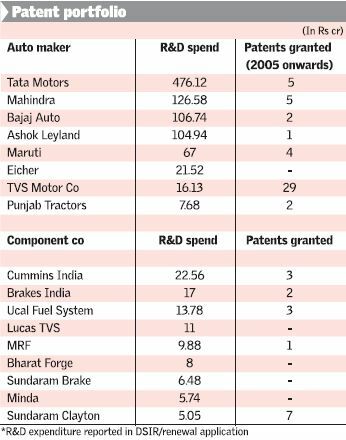 TVS motors’ R&D budget was around 3.5% of Tata Motors, but secured ~6 times more patents! VidyaCenter - attempting to be the eBay for Education? Bangalore is World's Number 2 Tech Hotspot - Do you agree?